This is a space combat simulator. Action takes place in the close proximity of Earth. Fly your space fighter and fight against enemy wings of fighters, bombers, and interceptors. There are also heavy ships in the battle, as well as detailed star fighters, bombers, interceptors, mid-size frigates with landing sites and huge cruisers with true 3D hangars. It has extremely realistic 3D modeling in a really exciting environment of space combat. 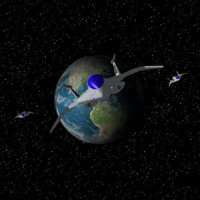 Features: Advanced space combat environment with extremely realistic 3D star crafts (approximately 3000 triangles each, number of LOD) and realistic 3D explosions; Control one of 3 star fighters in a variety of battles; Realistic 3D cockpits with wide-degree range of view; Each fighter has unique cockpit with HUD, IIP, and MFD; Cockpit indication system includes: HUD, MFD, fighter state panel, messages panel, radar panel; MFD can be toggled to display target, rear view, 3D map, missile view, info view; Helmet view; Targeting and pilot assistant system; 6 light star crafts (fighters, bombers, and interceptors); 2 mid-size ships (frigates); 2 heavy battle ships (cruisers); Cruisers are capable of carrying 1 to 6 full squadrons of star fighters; Frigate has landing site for 4 light crafts to land; Cruisers have true 3D hangars light crafts can enter in case of emergency or for repair; Extremely precise and fast life collision and hit detection; Hit point-specific damages; 4 tours of missions; A set of game options for single-player and network modes; LAN network play mode. TCP/IP. Up to 16 players; 3D accelerated graphics on all 3D cards supporting OpenGL; Sounds with 3D effects; Controls (keyboard / joystick).